German engineers have developed a new material called aluminum foam, which is essentially two layers of aluminum holding a metal alloy “foam” consisting of magnesium, copper, silicon, and aluminum. 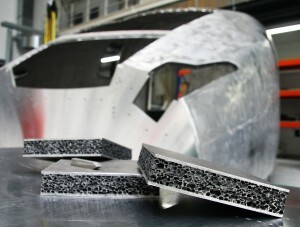 The aluminum foam is stronger than fiberglass and could potentially make future trains lighter, stronger, and safer. Electrostatic attraction, negatively charged particles bonding onto positively charged ions, is what holds the foam together. There is no need for glue or other adhesives and even when pulled apart, the bonds are so powerful the foam is destroyed rather merely slipping away. “We save approximately 60 percent on tool costs,” explained Thomas Hipke, from Fraunhofer Institute Hipke. Expect to see aluminum foam being used on trains as early as 2015.